Dow Jones Industrial Average News, 6/08/2016 – Traders were celebrating the Dow's three-day winning streak, while the S&P 500 hovered near an all-time high. A rise in oil prices offset concerns in the biotech sector, and weakness in the jobs market couldn't offset commodity gains fueled by a sliding dollar. While the headlines today centered on Lululemon Atheletica Inc.'s (Nasdaq: LULU) weak earnings report and Apple Inc.'s (Nasdaq: AAPL) massive bond sale in Taiwan, a number of stories slipped under the radar. Here's what you need to know about the markets on June 8, 2016. First up, the dollar continued a four-day slide as markets have priced out the possibility of an interest rate hike in June. The U.S. Federal Reserve is set to meet on June 14-15 to discuss monetary policy and the health of the U.S. economy. A rate hike would have helped strengthen the dollar against commodities and other currencies. The central bank is more interested in determining what is happening in the U.S. job markets and eyeing what voters in the United Kingdom will do when they vote on the possibility of leaving the European Union – also known as the Brexit – in two weeks. The falling dollar helped push up gold prices 1.3%, while silver added nearly 4%. Tough news came in the jobs sector after hiring levels fell to their slowest rate since August 2014. According to the U.S. Labor Department, the monthly hiring rate fell to 3.5%, down 0.2% from the previous month. That will place a significant emphasis on the number of people seeking unemployment benefits last week when the Department makes its weekly report tomorrow morning. That slowdown in hiring could help explain the week May jobs report that stopped the Federal Reserve's interest rate plan in its tracks. On the political front, presidential candidates Hillary Clinton and Donald Trump traded another round of jabs a day after the former unofficially claimed the Democratic nomination. Clinton questioned Trump's values and tone in recent months; meanwhile, Trump accused Clinton of running the U.S. State Department like a personal hedge fund and of operating an "illegal" server to conduct official agency meetings. Lost in the political back-and-forth is the question of whether Clinton's primary competitor Sen. Bernie Sanders (D-VT) should continue his campaign up until the Democratic convention. So, when will Bernie Sanders drop out of the 2016 presidential race? In deal news, shares of LendingClub Corp. (NYSE: LC) couldn't even eek out a 1% gain on the day despite news that the co-founder and CEO Renaud Laplanche is working to take the company private. Since the peer-to-peer (P2P) lending giant's high-profile IPO in late 2014, the stock is off more than 80%. The thing is, taking this company private isn't going to solve the much bigger problems in the P2P industry. Crude oil prices were pushing higher again on news that U.S. inventory levels experienced a 3.2 million barrel drawdown last week, while the nation saw a boost in end-product production like gasoline and distillates. The U.S. Energy Information Administration says that crude production in the United States is back on the rise after months of consistent downturns. WTI crude added 1.6%, while Brent crude ticked up another 1.8%. The rise in prices didn't do much for multinational energy firms. 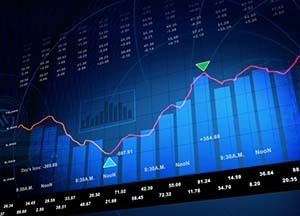 Shares of both Chevron Corp. (NYSE: CVX) and Exxon Mobil Corp. (NYSE: XOM) slipped today. What investors might be missing is the positive impact that rising crude prices are having on energy-dependent industries that rely on oil companies as customers. First, railroad firms CSX Inc. (NYSE: CSX), Norfolk Southern Corp. (NYSE: NSC), and Union Pacific Corp. (NYSE: UNP) all saw daily gains above 2% as firms anticipate more business due to higher prices. The drawdown shows that crude oil is being transported and refined into end-products for consumers. Meanwhile, shares of sand procurement firms – a key commodity in the fracking process – continued to rise. Shares of Hi-Crush Partners LP (NYSE: HCLP) added 1.8%, while Emerge Energy Services LP (NYSE: EMES) gained a whopping 12.2% on the day. Media analysts were talking up the $1.38 billion bond sale by Apple Inc. (Nasdaq: AAPL) in Taiwan. But they missed the bigger story about the company's continued search for international growth and why it's time to be bullish about AAPL stock. Here's the latest on why Apple offers some of the strongest profit potential on Wall Street today. Shares of Amazon.com Inc. (Nasdaq: AMZN) were trending today after CEO Jeff Bezos announced plans to invest another $3 billion in India. Bezos said that AMZN sees "huge potential in the Indian economy." While Bezos is right – there is massive potential there and tech companies are pouring money into the emerging market – what does he know that others do not? India's economy continues to struggle despite dramatic reforms – and the company will face very stiff competition from local competitors. Shares of UnitedHealth Group Inc. (NYSE: UNH) rallied more than 2.5% and offered the biggest boost to the Dow after analysts boosted their outlook for the health insurance company. The firm increased its dividend by 25%, raising expectations for the long-term outlook for the company. That said, if you're interested in dividend stocks, you should really learn more about "dividend aristocrats," which offer the best bang for your buck. Here's a breakdown of companies that have been boosting their yield for 25 years.